Employee scheduling is a repetitive, ongoing process. If you’re doing your scheduling with pen and paper or even by Excel spreadsheet, it can also be extremely tedious and time-consuming. 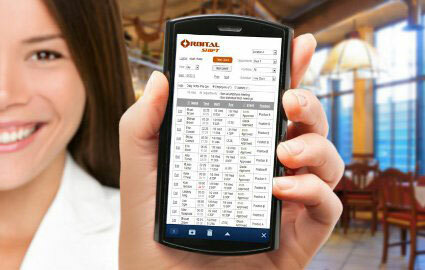 Orbital Shift offers an easy-to-use work schedule template that streamlines and simplifies the scheduling process. You might even find that you enjoy using it, instead of dreading the thought of creating and managing schedules for your team. "I have been in the restaurant industry for well over 30 years. I have used several other scheduler programs each unique in their own way, but all not even close to what Orbital Shift offers and delivers." 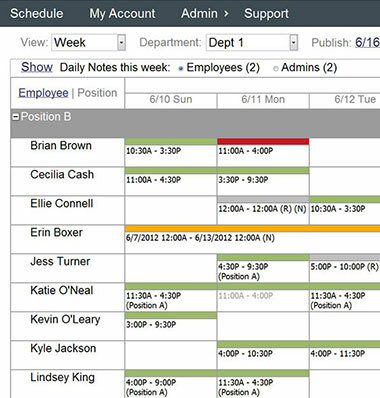 Our employee scheduling template is available online, which means you can access it at any time with your Web-enabled computer or mobile device. Use the online schedule template to drag and drop shift scheduling events for easy management. You can also copy and paste schedules by job code to ensure greater speed and consistency. What’s more, you can customize your schedule template to meet your unique scheduling requirements. And if you happen to make a mistake, you can easily correct it by dragging a shift to a new employee or work period. You don’t have to be a computer or software expert to create and manage an employee timesheet with our software solution. We’ve designed our product to be easy to use, which means you and your staff can get up to speed in no time. We also provide complete support for as long as you’re an Orbital Shift client. In addition to prompt and reliable phone and email support, you’ll have access to a wide range of resources such as videos, online tutorials and even training sessions for managers. Stop using pen and paper or confusing excel documents, our user friendly interface makes the tedious process of scheduling simple and enjoyable. Still prefer paper and spreadsheets? That's alright! 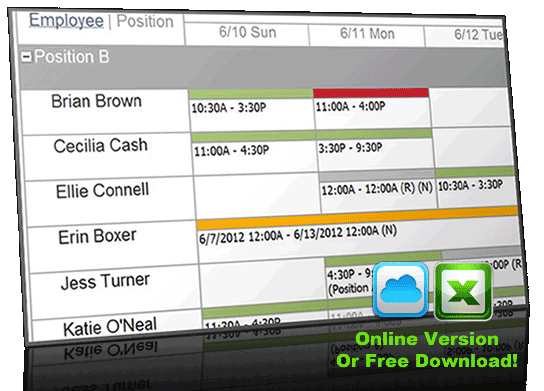 Feel free to learn more about our online scheduling software or you can download an offline work schedule template. "We had a very organized system in place but Orbital Shift still saves me time each week. It is an extremely affordable option, especially considering access, programming, and the exceptional customer service they provide. " "Using Orbital Shift has cut my time down to 1/3 of what it previously took me to create and maintain schedules, saving me several hours each week. "